Natural Crystal Stones and Clusters, Macrame Crystal Holders, Hematite Pentagrams, Steoralite or Fairy Cross, Chiastolite, Gem Chips, Amethyst, Citrine, Quartz, Crackle Quartz, Pyrite and a range of Gem filled Bottles from our Earth - The Realm Of White Magic On-line Ordering. Empower your Realm of spiritual well-being with the magic of Incense, Herbs, Powders, Crystals, Spells and much more. Specialists in rare botanicals, incense and magical supplies since 1989. Here is a fine selection of Natural Crystal formations, each one is unique. Each possesses its own beauty and magickal qualities. 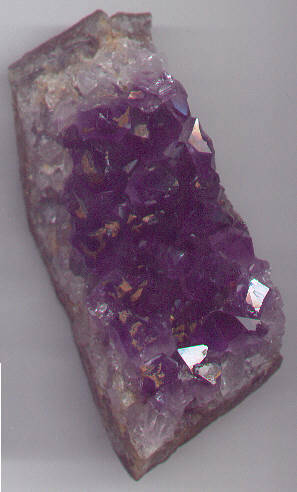 Select from the various sized Amethyst Cluster (Druze) and Citrine Cluster (Druze). Discover the legend and magick behind the 'Fairy Cross' Crystals and the benefits of Chiastolite Stone. Start your Crystal Gem Collection - Order your chosen Bottle Of Gems or the full set. 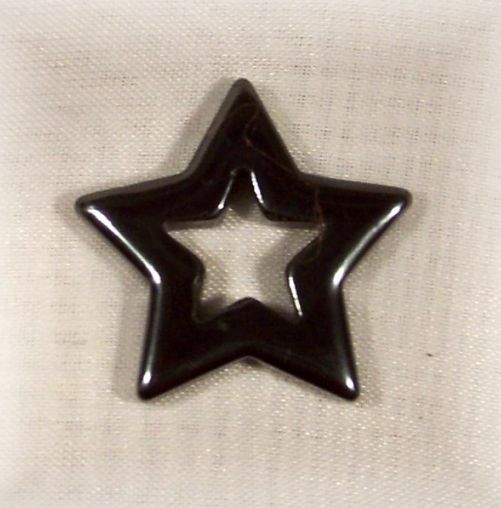 You will find a lovely Hematite Stone Pentagram and a selection of Pocket Crystals, plus NEW Natural Crystal Cabachon Stones which have been especially chosen for their high grade quality and size. Cabachons stones are shaped and ready to be set into jewellery or magickal tools. Each glass Gem Bottle is filled with crystal chips and sealed with a cork. These cute bottles are labelled accordingly. You can easily remove the gems in this bottle or add your favourite oils or herbs to further empower their vibrations. Line these gem bottles up for a colourful display, add to your Crystal Collection - 13 Gem Types to choose from. Clear Quartz, Amethyst, Adventurine, Garnet, Citrine and Mixed. When ordering your bottle of Gems - choose your crystal or we will choose for you. Why not order the full set to add to your gem collection or makes an earthy gift for friends and family. A popular gift or party favour for childrens parties and birthdays. Spend $60 and over on this site - Receive 1 x Crystal Gem Bottle - FREE. 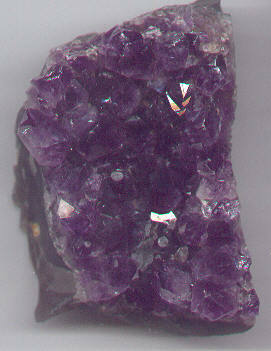 Select from various sized Amethyst Clusters on our order form. 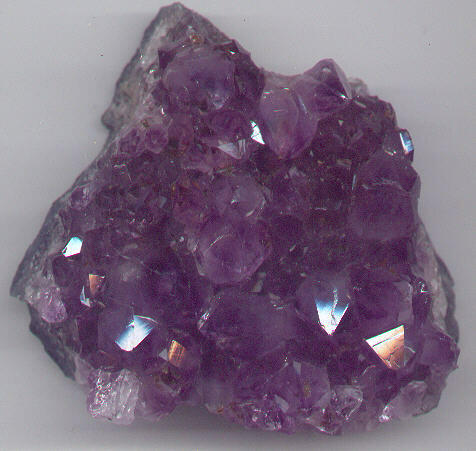 Price varies according to the weight - our new shipment of Uruguayan A GRADE Amethyst druze aregorgeouss deep/dark purple (much darker than the sample amethyst photos on this page). Beautiful pieces to add to your crystal collection. Prices are Per Cluster from $20.00 - Weights from 83gms to 102gms. Sizes available shown on order form. Select from various sized Citrine Clusters on our order form. Price varies according to the weight - our new shipment of Citrine Druze are taller than usual clusters showing more depth of the crystals formation - these are really nice quality Citrine druze. Beautiful pieces to add to your crystal collection or give a friend, the gift of Citrine. Prices are Per Cluster from $6.00. Weights from 148gms to 622gms. Available sizes shown on order form. Natural Citrine takes its name from its lemony colour which can vary from light champagne to cognac. Known as the stone of Abundance and joy, with its appearance of having captured the sun. A stone of plenty which maintains and attracts abundance on all levels. Often referred to as the Friendship stone, give the gift of Citrine to strengthen and nurture special friendships. Choose from five colours - Purple, Hot Pink, Aqua Blue, Brown and Beige. Match the coloured crystal with a colourful macrame crystal holder to suite your mood every day! Hang in your car, house or place on your altar. 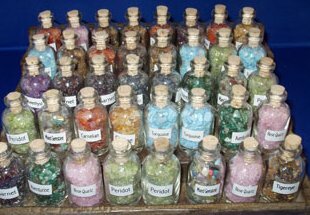 Use in colour magickal workings to further empower your spells. Add to magickal tools or dream catchers. Wear as a necklace and colour co-ordinate your marcrame holder and crystal to accessorize your outfit. Give one to a friend, child or loved one for an unusual gift. Made from cotton, each Macrame Holder has two black beads and is 43cm in length. Push down the bottom black bead to secure your crystal in place. 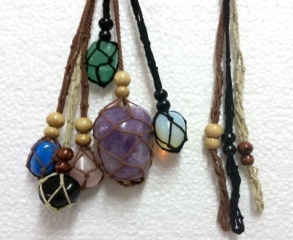 Order a Pocket Crystal or Tumbled Stone to go with your Macrame Necklace. Available in five vibrant colours - this tumbled stone comes in white, yellow, blue, green and purple. Crackle Quartz crystal is believed to strengthen, stimulate and protect. 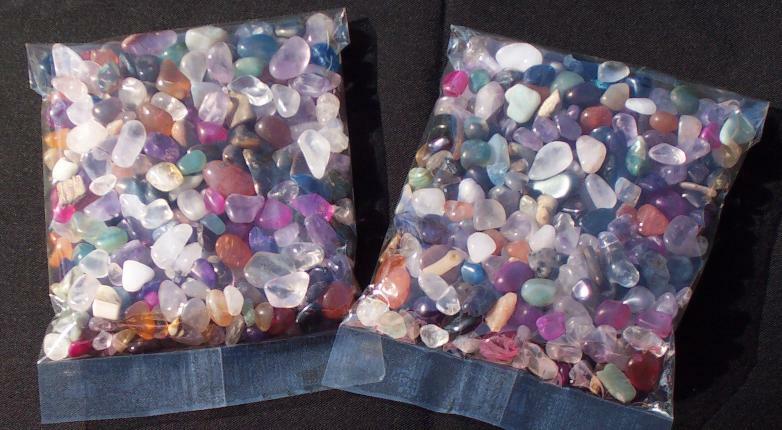 Children really love these colourful, twinkling stones. Gaze at the intricate patterns in each Crackle Quartz - real eye candy! Use in colour magic, elemental magic, place on your altar or special space. Use in craft or making of magickal tools. Give one of these delightful crystals to a friend, child or loved one. Carry in your pocket or Macrame 'Pocket Crystal' Holder! 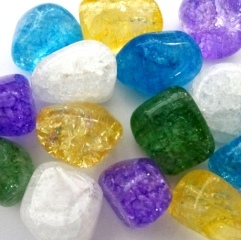 Weight per set of 5 coloured Crackle Quartz tumbled stones is approx 60-70gms. Each stone is around 2-3cm in size. 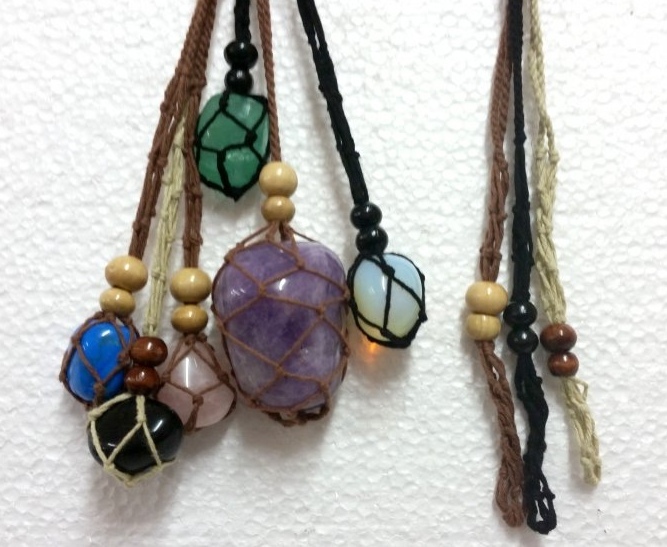 Wear a Crackle Quartz Tumbled Stone in your Macrame 'Pocket Crystal' Holder. Pyrite is also known as 'Fools Gold'. Pyrite is believed to protect one from danger, dispels negativity, improves memory and helps to nourish the mind and body to promote good health. Use in protection magic, add to mojo bags to help repel negativity or place on your altar or special space. Use in craft or making of magickal tools. Give a Pyrite crystal to a friend or loved one. Carry in your pocket or Macrame 'Pocket Crystal' Holder! 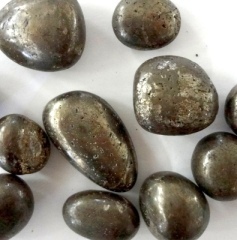 Weight per 5 tumbled Pyrite stones is approx 40-50gms. 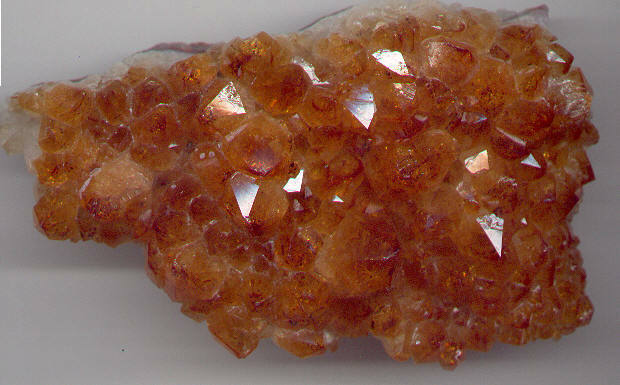 Each stone is around 1-2.5cm in size. Wear Pyrite Tumbled Stone in your Macrame 'Pocket Crystal' Holder. These brilliant coloured crystal stones are a fine addition to your crystal collection. 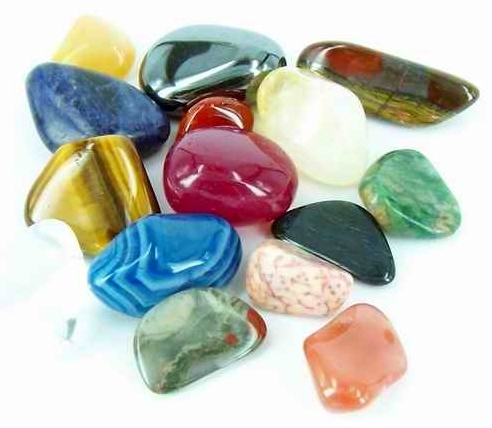 An assortment of tumbled crystals 1.5-3cm in size. These medium sized stones are typically round or oval shaped. Each 160gm pack contains approx. 9-12 crystals. A great gift for children or use in arts and craft projects as well as adding to your magickal tools or altar. Crystals types vary in each pack such as Hematite, Lapis Lazuli, Amethyst, Citrine, White Agate, Blue Quartz, Clear Quartz, Jasper, Snowflake Obsidian, Agate and Rose Quartz. Carry in your pocket or Macrame 'Pocket Crystal' Holder! 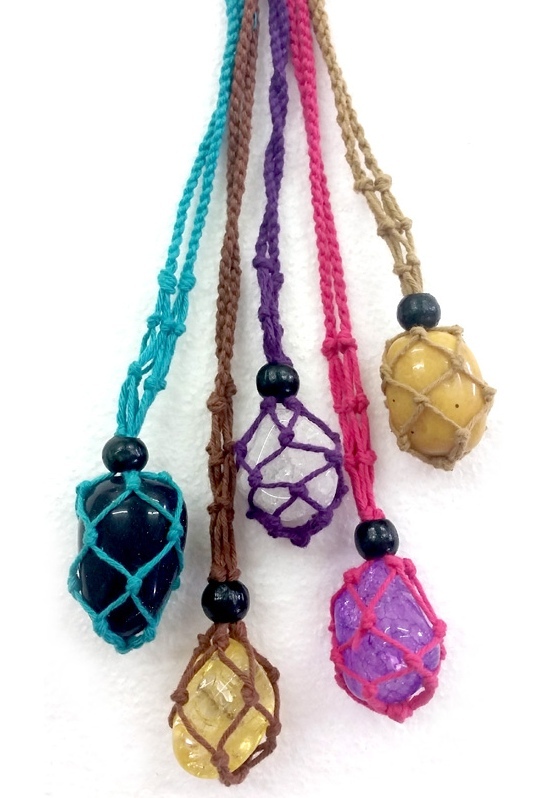 Wear a Pocket Crystal Tumbled Stone in your Macrame 'Pocket Crystal' Holder. An assortment of crystals from Australia, approx 2cm - 4cm in size. Each 160gm pack contains at least 10 crystals or more. The tumbled crystal shapes include - flat slithers, triangle, prism, oblong, round, oval and freeform showing lots of natural effects and formations within the stones. A great gift for children, friends and family. Carry in your pocket or Macrame 'Pocket Crystal' Holder. These crystals are big enough to decorate any magickal tool or item. Lay these around your window sills, in a crystal bowl or add a few to your fish tank for some natural colour. 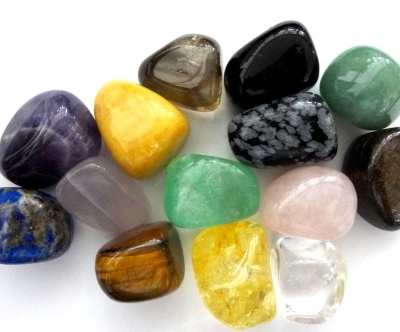 Crystals types vary in each pack such as Amethyst, Citrine, Tiger Iron, Tiger Eye, Blue Lace Agate, Aqua Marine, Blue Quartz, Clear Quartz, Jasper, Hematite, Snowflake Obsidian, Crysophase, Agate and Rose Quartz. The inclusions and natural growth patterns look effective and these crystals will range in colours from lime greens, soft pinks, yellows, deep browns and greens. Limited Availability. 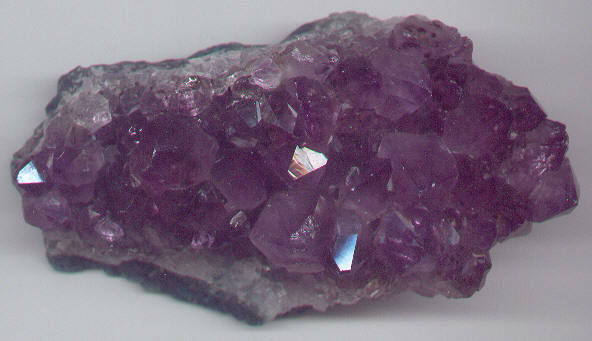 Our Pocket Crystals have been popular so we offer you a new size - 'Mini Pocket Crystals'. These brilliant coloured crystal stones are a fine addition to any crystal collection. An assortment of mixed tumbled crystals and crystal chips approx 0.5 - 1.5cm in size. Our Mini Pocket Crystals have a variation in size and shape from long thin crystals to rounder shapes. Comes in a 100gm pack. A great gift for children, use in arts and craft projects, friends and family. These crystals are small enough to decorate any magickal tool or item. Crystals types vary in each pack such as Hematite, Lapis Lazuli, Amethyst, Citrine, White Agate, Blue Quartz, Clear Quartz, Jasper, Snowflake Obsidian, Agate and Rose Quartz. Display your Mini Pocket Crystals in a small Glass Jar, Vial or Bottle. The Fairy Cross is a RARE stone, believed to protect the wearer and is associated with the four elements, Earth ~ Air ~ Fire ~ Water. These Staurolite Crosses have been hand picked for quality and detailed cross formation. Rare & Limited Availability! 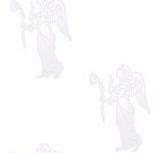 **This is a one off item, you will receive ONE of the exact Fairy Cross shown in this photo. 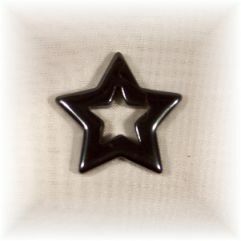 **This is a one off item, you will receive the exact Fairy Cross as shown in the photo. 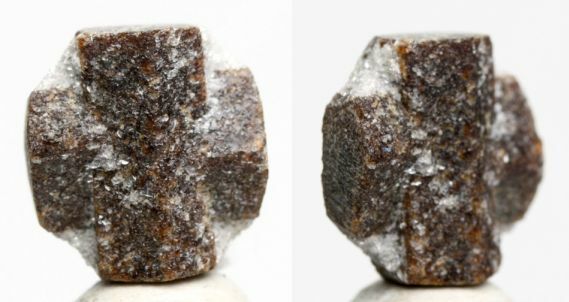 This Fairy Cross weighs 0.9gms and has traces of twinkling mica schist. The angle of the cross is 90 Degrees which is rare! This Fairy Cross comes to you still in its natural rock formation - silvery twinkling mica schist. Its weight is 14.2gms. This specimen is quite large, which is rare! The reddish brown staurolite twins contrast sharply with the silvery white mica schist matrix. This impressive Staurolite specimen is suitable to be bezel-set around the mica schist as a jewellery pendant or brooche. This Fairy Cross comes to you still in its natural rock formation - silvery twinkling mica schist. Its weight is 11.1gms. This specimen is quite large, which is rare! The lustrous, reddish brown staurolite twins contrast sharply with the silvery white mica schist matrix. This impressive Staurolite specimen is suitable to be bezel-set around the mica schist as a jewellery pendant or brooche. 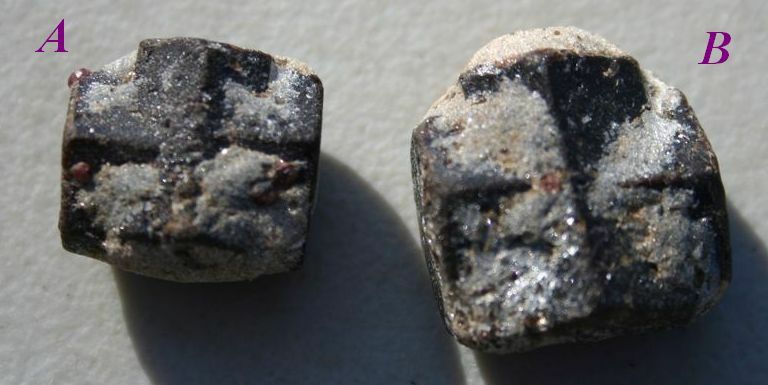 This Fairy Cross has traces of twinkling mica schist and weighs 7.7gms. This specimen is quite large and with an angle of 90 Degrees, quite rare! 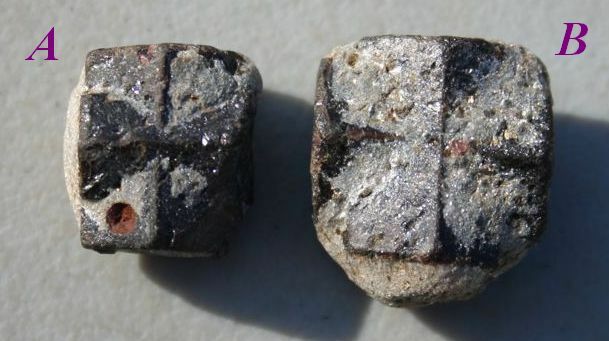 This Fairy Cross has traces of twinkling mica schist and weighs 12.1gms. This specimen is quite large and with an angle of 90 Degrees, quite rare! **These are a one off item, you will receive the exact Fairy Cross as shown - Order either Cross A or B. The Fairy Cross is a natural earthy brown coloured smooth crystal cross - made up of twinned crystals which form into equal-armed Crosses, or X-shapes. Each Staurolite Crystal Cross varies in appearance and according to legend is known as the 'Fairy Cross'. In magic, the Staurolite 'Fairy Cross' represents the four Elements. Because of its shape, the Fairy Cross is carried or worn by those wishing to balance the four elements within and it is placed on the altar for power during magickal rituals of all kinds. The Staurolite 'Fairy Cross' is said to protect against negative energies, disease and accidents. Empower your Fairy Cross and keep in the car. Also believed to energize sexual drive and draw wealth to the bearer. There are many superstitions surrounding this little cross. ...........It is said that long ago good fairies were dancing around a spring when a elfin messenger brought news of the crucifixion of Christ. The fairies wept. As they cried, their tears fell to the ground - forming these enchanting crosses of stone. Long after the fairies disappeared, these amazing crosses of the mineral Staurolite remain. This unusual tumbled stone is approx 1cm - 2cm in diameter. Oval in shape and flat on both sides. These Chiastolite Stones have a hole drilled through the centre. Place Chiastolite as appropriate or wear around the neck, string these stones onto a necklace or use in making ritual jewellery. Hang several 'Cross Stones' with other beads/stones to create a special crystal hanging or combine with magickal tools. The Chiastolite 'Cross Stone' is a variety of Andalusite which occurs in the form of stout crystals, exhibiting the axis and angles in a different colour from the rest and producing a coloured distinctive cross. Generally, Chiastolite comes in brown-gray, rose, gray, reddish-brown and olive green. It is found in Chille, Russia and Spain. Chiastolite is a powerfully protective stone and associated with deflection of the 'evil eye'. It is now used as a sign of devotion. It signifies both death and re-birth, bringing one to the state of realization with respect to understanding immortality. It is a bridge for 'crossing-over' - providing the means of transportation as well as the unobstructed avenue. 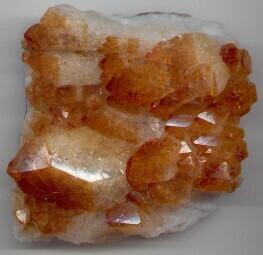 Chiastolite is helpful during a state of change, assisting to gain a foothold into the new. It can also be instrumental in both astral and mind travel, again providing the 'password' for entry. Psychologically, Chiastolite dissolves illusions, dispells negative thoughts and feelings, enabling you to face reality. Mentally, Chiastolite aids in problem solving by strengthening analytic capabilities. Use Chiastolite is used to provide insight to answers to mysterious occurrences. It assists in both creativity and practicality, balancing ones perspective in all matters. 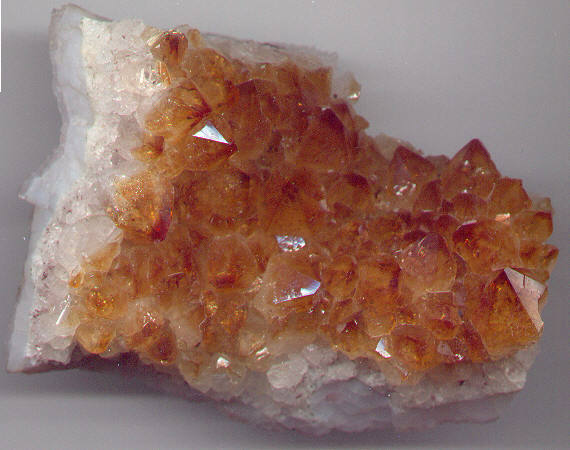 Chiastolite maintains spirituality during illness or trauma, invoking protective forces. Chiastolite is said to balance the flow of blood, to increase the secretion of milk in nursing mothers and to repair chromosome damage. 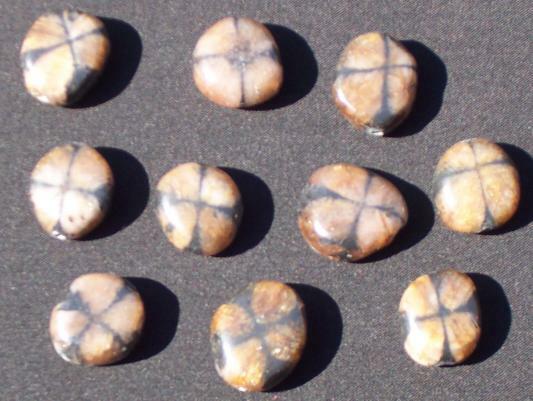 Chiastolite or Cross Stone vibrates to the numbers 3 and 4. It is associated with the astrological sign of Libra. Carry with you, place in mojo bags, use to decorate your magickal tools or in spellwork.